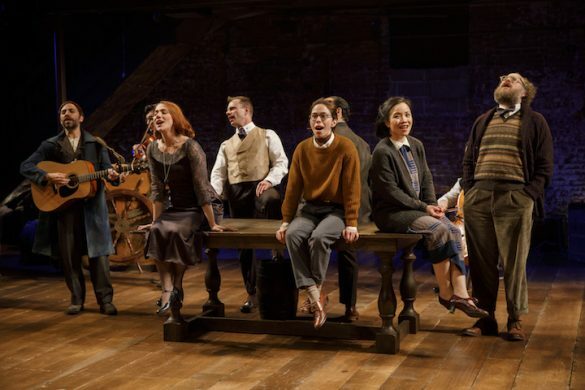 Off Broadway’s Storm Theatre Company, which has produced more than 50 plays since 1997, has made its mark by selecting a diverse repertory ranging from the classics to the modern, usually with an emphasis on plays other companies rarely take a stab at. 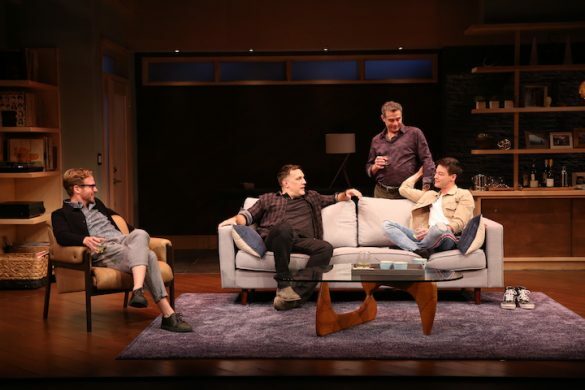 Their productions are often more to be honored for their high-flown intentions than their artistic achievements, but without them serious New York theatregoers would never have a chance to see many important but largely neglected dramas of the past and present. 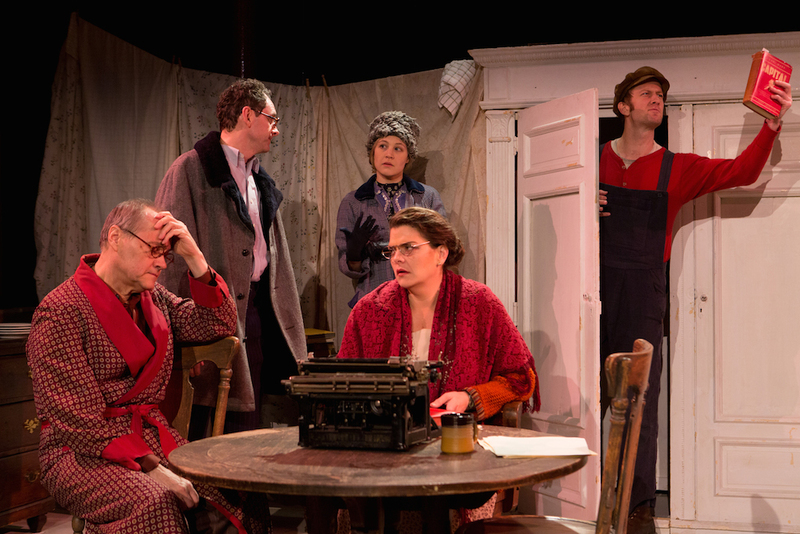 A good example is their current staging of Collaborators, Scottish playwright John Hodges’s (Trainspotting) unusual black political comedy set in Moscow between 1938 and 1940 and centering on an imagined collaboration between famed writer Mikhail Bulgakov (The Master and Margarita) and Soviet dictator Josef Stalin on a play about the latter’s life. Collaborators, despite winning England’s 2012 Olivier Award for Best New Play, after premiering at the Royal National Theatre with outstanding performances by Simon Russell Beale as Stalin and Alex Jennings as Bulgakov, hasn’t been seen here before, although its theme of the freethinking artist’s struggle to maintain his integrity within an oppressively authoritarian regime would certainly strike a sympathetic chord. 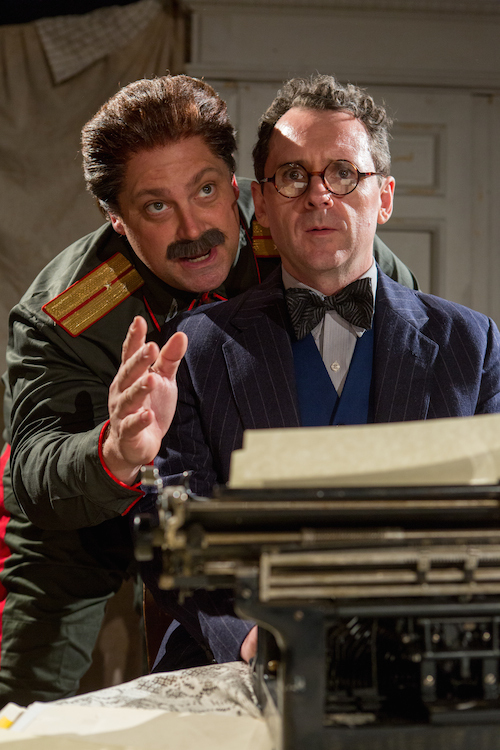 There’s no evidence that the play’s collaboration ever happened but it’s true that Bulgakov, who despised Stalin, wrote a hagiographic play about him. Why would he have done this, especially since it so obviously weakens our respect for his well-documented dissidence? Collaborators makes you ponder the question, but, having other fish to fry, really doesn’t answer it. Hodge’s fanciful setup is that Bulgakov’s play about Molière, treating the difficulties the French playwright faced under the tyranny of Louis XIV’s regime, has opened to acclaim but is being closed by the secret police, represented by Vladimir (Robin Haynes) and Stepan (Joseph Salvatore Knipper). They’ll permit it to reopen only if Bulgakov (Brian J. Carter)—suffering from a fatal kidney disease—agrees to write a play about Stalin (Ross DeGraw), celebrating his 60th birthday. Stalin, you see, is his number one fan (he saw The White Guard 15 times). Bulgakov reluctantly agrees but fails to produce any pages, eventually finding himself in a Kremlin hideaway with the jovially friendly Stalin. Oddly, Stalin himself chooses to write the play, which glorifies his anti-Czarist past, while, in return, Stalin insists that the playwright take responsibility for his own bureaucratic hatchet work, thereby forcing Bulgakov to sign off on the deaths of millions (the Great Terror, which actually occurred in the years just preceding the play’s action). As a result of his Faustian bargain, the hardships of Bulgakov’s life are eased; his tiny apartment, which he and his wife, Yelena (Erin Biernard), must share with others (including a young man [Joshua R. Pyne] living in the cupboard), gets heat, hot water, and coffee; even his health improves. Eventually, though, the strain of his compromises hastens the writer’s death. Director Peter Dobbins is unable to inspire his uneven cast to provide the proper intensity or stylistic talents needed to enliven this difficult material. The production, running nearly two and a quarter hours—despite being announced as 90 minutes—is leaden and flatfooted; entrances, exits, and scene transitions are sloppy; and the mostly realistic approach provides little evidence of the satirical, nightmarish, even phantasmagorical humor demanded by the script. 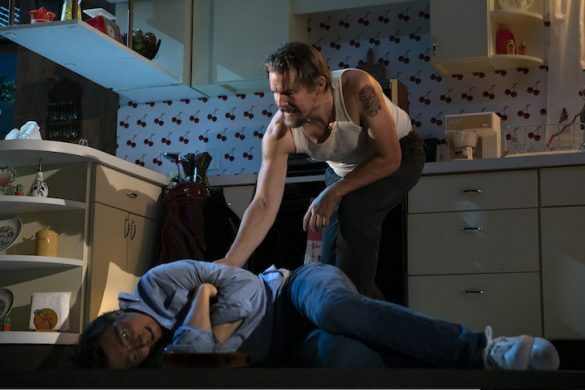 DeGraw and Carter, as the master and his menial, are skin-deep in complex roles; only Haynes’s NKVD officer shows the kind of instincts that, if properly exploited, might have made the production less of a slog.